In addition to 15.8-megapixel stills of impressive quality, the Panasonic G3 can capture 1,920 x 1080 Full HD video at 30fps in AVCHD mode, and can also record Motion JPEG movies at 720p. Anticipating more competition in the Compact System Camera space, Panasonic has revamped its G-series camera line, making a much smaller and lighter body that still integrates highly valued features, like an electronic viewfinder, a tilt-swivel LCD, and touchscreen control. Incorporating a new 16-megapixel sensor, Panasonic's Lumix G3 also has significantly improved image quality, now rivaling larger SLRs with larger sensors, an impressive achievement. Incorporating a faster Venus Engine FHD processor, the Panasonic G3 has blazing fast autofocus, another impressive feature that makes using the G3 feel just like an SLR. Indeed, the Panasonic G3 feels more like an SLR than most any other compact system camera, only a very small one. New features include Pinpoint AF, a touchscreen-enabled focus mode that automatically zooms in on a point to make focus point selection and confirmation easier and more precise. Compatible with a growing selection of Micro Four Thirds lenses, the Panasonic G3 is just as adaptable to most shooting situations as an SLR. The company's 11 lenses include macro, wide-angle, telephoto zooms, and even a 3D lens. Many other lenses are available from other manufacturers. The Panasonic G3 includes dust reduction technology, Intelligent Automatic exposure, the full complement of automatic, semi-auto, and manual exposure modes, and its kit lens includes optical image stabilization. Expected to ship in June 2011, the Panasonic G3 will be available with the 14-42mm kit lens for a suggested retail price of US$699. The Panasonic G3's aluminum body comes in four colors: black, red, white, and brown. There's a lot more to the Panasonic G3 than its small body reveals at a glance. Check out our hands-on preview and shooter's report below! Smaller, lighter, and faster: all three made the list of what we wanted from the next Panasonic G-series compact system camera, and the Panasonic G3 delivers. With the exception of the GF series, all Panasonic G models were too large to stand out from entry-level SLRs. The Panasonic G3, on the other hand, rivals the Olympus E-PL2 in size, yet it still includes an electronic viewfinder (EVF). That's exciting news for mirrorless camera lovers. More exciting, the Panasonic G3 delivers something else: excellent image quality that rivals its APS-C competition. Sporting a new 16-megapixel sensor, a 3-inch articulating LCD, and the same processor as the high-powered GH2, the Panasonic G3 is quite capable, yet it's about 6% lighter than the G2, and its body displaces about 25% less volume than its predecessor. While the G2 was 400 cubic centimeters, the G3 occupies only about 300cc. For those of us still using US weights, the 100cc difference equals 6.1 cubic inches of reduction. Not bad at all. Measurements are 4.5 x 3.3 x 1.8 inches (115 x 84 x 47mm), and weight is 20.6 ounces (583g), while the G2 was 4.9 x 3.3 x 2.9 inches (124 x 84 x 74mm) and 21.8 ounces (618g) (all weights include battery and kit lens). The front end shows how dramatically the grip has been reduced, as well as the overall width. It's more of a finger grip now, with a nice inward curve and soft rubber texture that caresses the fingers. An AF-assist lamp appears in the upper right corner, a handy feature missing on many digital SLRs. The Panasonic G3 is noticeably slimmer front to back as well, even with the articulating LCD, showing some impressive engineering here. Lens styling has changed a little for this model, to an all black design with a new chrome band around the middle, rather than the silver-gray rear bezel that shipped with the G2. Like the G2, the lens-side bayonet is plastic, though the camera's mount remains metal. The kit lens also comes with a lens hood, something omitted on most SLR kit lenses. Most of the dials and switches are removed from the top deck, and the Mode dial is smaller with fewer settings, eight instead of 13. The hot shoe on the Panasonic G3 is also moved back quite a bit, now overhanging the LCD to make room for the stereo mics, which are absent on the G2 (it has a mono mic on the left top deck), and rather awkwardly mounted on the pop-up flash on the GH2. While the shutter button was perched out on the grip on past models, it's retreated to the confines of the top deck, leaving little room for a Record button, so that migrates once again to the rear of the Panasonic G3 (Panasonic recently moved the Record button to the top on most of its cameras, and now it's moving again). The Intelligent Auto button lights up blue when pressed, and unfortunately it's too often pressed by accident. The Power switch is well-positioned for easy activation. On the back is the very tightly integrated tilt/swivel LCD, with a much smaller hinge and outer bezel, leaving just enough room on the upper right for a small thumbgrip that's just big enough for the center of the thumb to hold without activating the Rear dial (if you're careful). The LCD moves 180 degrees to the side and swivels 270 degress up and down, allowing it to face forward for easy self portraits. The DISP./Fn1 button is also flush with the body, reducing the chance of accidental activation. Gone is the AF/AE Lock button, something many will miss. You can set the Fn1 button to activate AF/AE Lock, Depth-of-field Preview, or 15 other features, so it's not a total loss. Pressing the Rear dial switches between Program shift (in Program mode) and EV compensation. In Manual exposure mode, pressing the dial switches between shutter speed and aperture settings. The Record button on the back requires a good firm press to activate, which is somewhat annoying, since recording is slow to both start and stop. The Playback button is also hard to activate because it's so close to the protruding electronic viewfinder housing. The Electronic viewfinder is the same gorgeous, gridless 800 x 600 design (1.44 million dots), but Panasonic has improved the design to minimize the color ghosts we've seen in the past. It's hard to notice a difference between the Panasonic G3 and the GH2 we also have in-house, with the GH2 actually looking a little better. The Panasonic G3's LCD is the same 460,000-dot display of its predecessor, and is a touchscreen design. The Panasonic G3 leans on the touchscreen for many controls, but most menu navigation and setting selections can also be done with the four-way navigator as well. In our prerelease model, the Panasonic G3's touchscreen was a little finicky, not always obeying common gestures like swipe in Playback mode, often not registering direct touches on onscreen buttons. More on this and other handling discussion in the Field Test below. Sensor. At the heart of the Panasonic G3 is a newly developed, 4:3 aspect ratio Live MOS image sensor that yields 15.8 megapixel images, from a 16.0 effective megapixel sensor. Compared to the 12 megapixel chip from the G2, the new imager not only has slightly higher resolution, but also appears to yield improved noise performance. Panasonic says they've achieved this through noise reduction at the pixel level, and through improvements to the signal amplifiers. Panasonic claims an improvement of 6dB noise at ISO 3,200, and 9dB at ISO 6,400. This would be an impressive accomplishment: 6dB translates into two full stops of noise improvement. In addition to the full 15.8 megapixel resolution, the Panasonic G3 also allows shooting at two reduced resolutions of approximately eight and four megapixels, respectively. 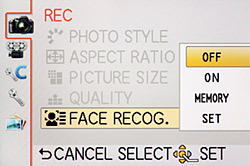 The camera also offers aspect ratio options of 3:2, 16:9, and 1:1, in addition to the sensor's native 4:3 ratio. Processor. The Panasonic Lumix G3 uses the same powerful image processor that debuted in last year's GH2 model. With three processor cores, the Panasonic Venus Engine VI FHD CPU provides improved performance over earlier generations of Venus processors. In particular, the Panasonic G3 offers a significant step forward from the previous G2 model in terms of autofocus speed. As with the GH2, the company claims that the G3 will be able to lock focus with the 14-140mm lens in an impressive 0.1 second. Of course, that's due in part to the lens itself, but the lenses offered in the two-lens kit version are also fairly fast. The 14-42mm lens should yield a focus lock in 0.18 second, and the 45-200mm lens in about 0.25 second. We measured slightly slower times in our lab tests, but we were all very pleasantly surprised by how responsive the G3 was in actual use out in the field: It easily felt the equal of any consumer-level SLR we've used in the past; an impressive accomplishment for a camera with contrast-detect autofocus. 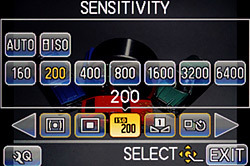 ISO sensitivity. The Panasonic G3's ISO sensitivity range of 160 to 6,400 equivalents is unchanged from that of the G2 at the top end, but slightly contracted from the G2's lower limit of ISO 100. This is likely due to an increase in the image sensor's base sensitivity. Although the maximum sensitivity is unchanged, the higher sensitivity modes appear to be more usable, thanks to the improvement in noise performance. As with the earlier Venus Engine HD II processor in the G2, the G3's Venus FHD chip processes chroma and luminance noise separately, and is said to improve noise reduction while still retaining fine subject detail. Burst shooting. The increased speed of the Venus Engine FHD processor also shows up in the Panasonic G3's burst performance, which is significantly improved from that of its predecessor. According to Panasonic's specifications, the G3 is capable of full-resolution burst shooting at four frames per second, fully 25% faster than the 3.2 fps claimed for the G2. (Our tests showed 3.4 frames/second, perhaps due to the late-beta status of our test sample.) If resolution is reduced to the lowest four megapixel mode, the G3 is capable of a whopping twenty frames per second, using an electronic shutter. Focusing. As noted above, the Panasonic Lumix G3 has inherited a significant step forward in its contrast-detection autofocus speed, as seen previously in the GH2. The improvement isn't just related to the new image processor, but also hails from a doubling of the sensor drive speed from 60 to 120 frames per second. (Lens control sync is still performed at 60 frames per second, but the camera's autofocus system can check the current state of focus 120 times/second for improved responsiveness.) As with other cameras using contrast detection autofocus systems--including all Micro Four Thirds models--the G3 performs autofocus by determining the contrast level at the focus point, then making a focus adjustment, and rechecking contrast levels to see if they've increased (moved towards focus), or decreased (moved away from focus). The Panasonic G3's dwell time--the time taken to check contrast in between focus operations--is said to be halved, with respect to that of the G2. This results not only in faster autofocusing, but also in smoother AF operation, which is a major benefit for autofocus during movie capture. Of course, the lens type in use also comes into play here. As with the G2, the Panasonic G3 has a 23-area autofocus system which also offers a Single-area mode with adjustable point size, there's also a Pinpoint mode that uses a much smaller focus point area. When Pinpoint AF is selected, the G3 automatically zooms the display by 6x around the focus point, and the focus point position can be quickly adjusted while zoomed in. This struck us as particularly useful, as it would for let you select your subject's eye and then precisely focus on this point. Another change from earlier models is that the Single-area mode now allows the focus point to be placed anywhere within the image frame, including the extreme edges. (In the G2, the AF area couldn't extend to the edges of the frame.) The Panasonic G3 also provides for focus tracking, which allows it to automatically follow your subject around the frame making focus adjustments as necessary, while a tracking lock is active. Of course, if you prefer to focus manually, the G3 allows for this as well. To aid with precise manual adjustment of focus, the G3 provides an MF Assist zoom feature that magnifies a portion of the image frame by either 3x, 5x, or 10x. At 3x magnification, the G3 provides a new picture-in-picture MF Assist mode, which allows you to adjust focus while still keeping the overall image framing in the right area. At higher magnifications, accessed by turning the Rear dial to the right, the MF Assist view occupies the full screen, and makes it considerably easier to judge in and out-of-focus areas. Face recognition. The Panasonic G3 also offers face-detection autofocusing, a pretty common feature these days on compact system cameras, as well as the vast majority of compact cameras, and in the live view modes of many DSLRs. The implementation on the Panasonic G3 allows it to detect as many as 15 faces in a scene simultaneously, and their locations are taken into account when determining focus and exposure variables. Panasonic goes a step further than most, though, also providing face recognition capability. When enabled, the camera attempts to locate the faces of up to six individuals whenever they appear within the image frame, and they're then prioritized over any other detected faces in the scene. You can also specify a priority order for the six faces, ensuring that your closest friends and family members are given the highest priority. Up to three recognition images can be recorded for each person, helping the camera to recognize each individual in a range of conditions. Images can also be tagged with the name and age of each person, when they're recognized in the scene--handy for quickly locating images featuring your friends in Playback mode, or with compatible software on your computer. LCD. Like the G2 before it, the Panasonic Lumix G3 features an articulated LCD display with a side-mounted tilt / swivel mechanism. It can swivel 180 degrees and tilt 270 degrees. The LCD itself has a 3.0-inch diagonal, and a resolution of some 460,000 dots. That equates to somewhere in the region of 153,600 pixels, commonly known as HVGA (Half-size VGA), with each pixel comprising adjacent red, green, and blue-colored dots. The panel has a 3:2 aspect ratio, approximately 100% coverage, and a wide viewing angle (although Panasonic doesn't specify the actual horizontal / vertical viewing range). Touch panel. The Panasonic G3 retains the touch panel interface that was introduced on the G2. This allows for control of a wide range of the camera's features by pressing on the live preview image, or on soft buttons shown on the display. It's possible not only to make settings changes through the touch panel, but also to indicate the desired subject from which the camera should determine focus or exposure, or begin focus tracking. The touch panel can also be used to control the new pinpoint focus mode, with a flick of the finger panning around the enlarged display (this was hard to do in our prerelease model; it may improve in the shipping version). You can even capture an image by pressing the touch panel, courtesy of a Touch Shutter function. The touch user interface also extends to Playback mode, where the panel can be used to switch between images with a flick, and to control the playback zoom / pan function. Of course, for those who don't like touch screens, all this can also be achieved using the camera's physical controls as well. Overall, the Panasonic G3's touch interface is one of the most natural and intuitive we've seen to date. Viewfinder. The Panasonic G3 also retains a similar electronic viewfinder design to that of the G2, but with one significant difference: the viewfinder's resolution is still 800 x 600 pixels, with a time-multiplexed design that means each pixel illuminates sequentially in red, green, and blue, providing the perception of full color at every pixel location. (Most electronic viewfinders use more traditional LCD displays, which have separate red, green, and blue dots for each pixel.) In the G3, though, the switching speed of the electronic viewfinder has been increased significantly, giving it a greater resistance to color breakup--the rainbow effect seen with time-multiplexed displays when you blink or suddenly move your eye. While we could still make it happen if we moved our eyes very rapidly, we did find the G3's display less subject to color breakup than similar EVFs we've seen in the past. The improved EVF performance is doubtless another benefit of the G3's faster sensor readout and image processing. As with the G2's EVF, the G3's viewfinder provides the equivalent of a 0.7x magnification on a 35mm camera (with a 50mm lens at infinity, and -1.0m-1), and offers an unusually wide -4.0 to +4.0 diopter correction. Eyepoint is 17.5mm from the eyepiece lens, just about right to see the entire image area with glasses just touching the rubber eyepiece. Flash. The Panasonic G3 includes a built-in, popup flash strobe with a guide number of 34.5 feet (10.5 meters) at ISO 160 equivalent. Flash sync is possible at up to 1/160 second, and seven flash exposure modes are available, including Auto, Forced, and Slow-sync, all with or without red-eye reduction. Both first- and second-curtain sync modes are available, and 2.0 EV of flash exposure compensation is available in 1/3 EV steps. In addition to the built-in flash, the Panasonic G3 provides for the optional DMW-FL220, FL360 or FL500 flash strobes, courtesy of a dedicated hot shoe. Video. The Panasonic G3's video functionality is significantly upgraded from its predecessor, and in one area even bests the GH2, although there are still some important points of differentiation where the GH2 holds an edge. The G3 now defaults to recording high-definition movies using the full AVCHD standard, rather than the more limited AVCHD Lite of the G2. It also newly allows shooting at 1,080i (aka Full HD; 1,920 x 1080 pixels), as well as the 720p (1,280 x 720 pixels) mode offered in the earlier camera. There are also VGA (640 x 480) and QVGA (320 x 240) standard-definition resolutions available, both recorded using Motion JPEG compression. The Motion JPEG compression type is also optionally available for 720p high-def capture. In all cases, videos are recorded using 30 frames-per-second output from the image sensor. 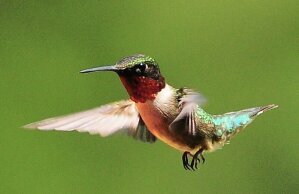 (By contrast, the Lumix GH2's sensor is read out at a full 60 frames per second.) For Motion JPEG video, the output frame rate is fixed at 30 fps, where the GH2 offers an adjustable 24 / 30 frames per second rate. 720p movies are recorded at 60 progressive-scan frames per second, and 1080i movies have 60 interlaced frames per second, although as noted above, these 60 fps modes are based on 30 fps data from the sensor. Where the G3 betters the GH2, though, is in video-mode autofocus. Unlike the earlier camera, the Panasonic G3 allows for full-time tracking autofocus during video capture. Intelligent Auto. Panasonic has split the Intelligent Auto (iA) mode seen in earlier cameras into two distinct modes for the G3. The existing iA mode allows the user to adjust only depth-of field, with all other exposure variables remaining under automatic control. The new iA+ mode additionally allows the user to tweak exposure compensation and white balance variables, thus giving the user more creative flexibility, while still keeping most decisions in the camera's hands. Custom modes. Where the G2 offered only one Custom position on its Mode dial, the Panasonic G3 now provides two Custom mode positions, marked as C1 and C2. Both positions allow for a variety of settings to be recalled for later use. The C1 position provides direct access to one specific Custom mode, while the C2 position allows access to a further three Custom modes, with the active set selected on-screen. White balance. The Panasonic Lumix G3 offers a wide range of white balance control, with a healthy selection of nine scene modes including Auto, five presets, two custom positions, and a direct Kelvin white balance input. This last allows direct input of color temperatures from 2,500 to 10,000 Kelvin in 100K steps, either by clicking on an on-screen adjustment bar, using the on-screen up and down arrow buttons, or the up and down arrows on the four-way controller. 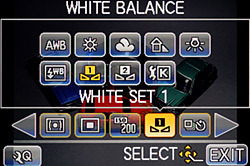 In addition, white balance can be adjusted on either a blue/amber or magenta/green axis, courtesy of a white balance adjust function. This white balance tweak can be applied either by indicating the desired position on a 2D graph using the touch screen, or using the cursor buttons. Finally, the G3 offers three-shot white balance bracketing, with all three captured images saved from a single exposure. Bracketing is possible either on the Blue / Amber axis, or the Magenta / Green axis. Metering. The Panasonic G3 employs a 144-zone multi-pattern metering system, capable of operating in Intelligent Multiple, Center-weighted, or Spot metering modes. The metering system is capable of functioning over a range of EV 0-18, using an F/2.0 lens at ISO 100 equivalent, and the G3 provides for a wide-ranging +/-5.0 EV of exposure compensation, set in 1/3 EV steps. An AE Lock function configured by two Custom menu settings allows the calculated exposure to be locked, either while the Function button is held in, or the lock toggled with subsequent presses of the button. Finally, the G3 allows exposure bracketing within a 3, 5, or 7 frame range, with a step size between frames of +/-3EV, in 1/3, 2/3, or 1 EV steps. Creative controls. Panasonic has retained its two main creative control function groups from the earlier G2 model in the G3, but with new names for each. The earlier My Color mode is now known as Creative Control, and provides access to five effects: Expressive (pop-art style), Retro (soft, tarnished effect), High Key (brighter image), Sepia, and High Dynamic (localized color and contrast enhancement). The Film Mode function has also been renamed to Photo Style. This offers a selection of six presets, plus a custom mode, each of which can be tweaked in terms of contrast, sharpness, saturation (except in Monochrome mode, where it is replaced with a color tone adjustment), and noise reduction. Presets include Standard, Vivid, Natural, Monochrome, Scenery, and Portrait. There are also 17 Scene modes that help amateurs get the results they're looking for without the need to understand shutter speeds, apertures and the like. Storage. The Panasonic G3 stores its data on Secure Digital cards, including the latest generation SDHC and SDXC types. As well as storing still images in JPEG compressed format, the G3 can also write RAW files, either alone or alongside a JPEG copy of each image. When using Panasonic's unusual 3D lens, the G3 saves images in MPO (Multi Picture Object) format, with each MPO file containing two JPEG images with differing perspective. Movies can be stored with either AVCHD or Motion JPEG compression, depending on the resolution. Power. The Panasonic G3 draws power from a proprietary 7.2V, 1010mAh battery pack rated as good for 270 shots on a charge when using the 14-42mm lens, based on CIPA testing standards. With the 45-200mm lens, this falls just slightly, to 250 images. As with all recent Panasonic cameras, the G3 incorporates ID-Security technology that prevents use of counterfeit or third-party batteries. Connectivity. The Panasonic Lumix G3 offers up an array of connectors for input and output. These include a USB 2.0 High Speed data connection, high definition Type-C Mini HDMI video output with Viera Link remote control compatibility, standard definition composite NTSC / PAL audio video output (or NTSC-only for North American models), and a 2.5mm mini jack for use with the optional DMW-RSL1 tethered remote control unit. It wasn't until Panasonic came out with the small GF1 that I got excited about the Lumix Micro Four Thirds cameras, and I gravitated instead to the Olympus Pen cameras for their simpler body design, smaller size, and better JPEG image quality. Note that I said JPEG image quality, because Panasonic's RAWs were just fine, but something was going wrong in the camera's JPEG processing and compression engine that was making the yellows green and the oranges brown, gradually worsening as ISO increased. Panasonic's faster autofocus and slightly better optics made even the GF1 a frustrating proposition because of that JPEG image quality problem. The G1, G2, GH1 and GH2 were just too big to catch my interest, their bodies not much smaller than a Rebel. Sure, the lenses are smaller, but the body had to be smaller too. The EVF was very nice, but that wasn't sufficient to overcome the large size and JPEG green shift. Though both of these cameras, the G3 and the Canon T3i, have a high-resolution sensor and an articulating screen, the G3 body weighs 13.6 ounces (386g) a fraction of the T3i's 20.1 ounces (570g), both with battery and card, and most of the lenses for the Micro Four Thirds system are quite a bit smaller and lighter than even Canon's EF-S line. The G3 is also lighter and smaller than the GH2 (whose body is about the same size as the G2), which lets it fit into smaller spaces. Body weight again is 13.6 ounces (386g) vs. 16 ounces (453g), and the body's quite a bit slimmer. Finally, the G3 feels about the same in the hand as the Olympus E-PL2, its protruding hump seems larger here, but in the hand I can hardly tell a difference. That's likely due to the similar weight, with the E-PL2 coming in at a slightly lighter 13 ounces (369g). But the G3 has an articulating screen and a built-in electronic viewfinder, two advantages for some users (I don't much miss these two things, and I'm a fan of the E-PL2, but the differences are worthy of note). The G3, though, doesn't have a collapsible lens, and its EVF housing protrudes quite a bit out the back, making it less compact overall compared to the E-PL2, so there are still tradeoffs. The point is that the new G3 competes well with all these cameras, offering a lot in a very small space. Ergonomics. The latest truly easy to hold CSC was the Olympus E-PL2, whose grip is nicely sculpted front and back. The Panasonic G3 bests it by just a little, fitting in my hand just right, its tapered grip design meeting my skin and hand shape just about right, and the smooth, yet grippy rubber is warm to the touch. The thumbgrip on the back isn't quite as robust as the E-PL2, but my thumb finds a comfortable spot just left of the Rear dial. Those with longer fingers have found comfort curling their fingers around the grip, something that doesn't quite work for me, but no one so far has decried the grip as too small. There are no sharp edges on the Panasonic G3, so it's also comfortable to hold with your left hand. Wide strap lugs also replace the noisy D-rings found on the larger G-series cameras, a welcome trend that we hope continues. There's less to jut into your hand, and the D-rings won't make noise that gets picked up in videos. Flash. The Panasonic G3's flash was handy, though its close proximity to the lens gave my subject red eye even though he was looking away. Speed. Speaking of SLRs, their chief advantages besides interchangeable lenses are an optical viewfinder, a larger sensor, and greater autofocus speed. See below for the former two, but the latter item is addressed by the Panasonic G3's surprisingly fast autofocus system. SLRs are fast because they use phase-detect autofocus, but in their new live view modes, they really lag behind even most point-and-shoot cameras. But the Panasonic G3 uses contrast-detect only and still manages to focus like an SLR. It's so fast that I often find myself refocusing just for the fun of it. Our testing shows it to be a little slower than the GH2, which is even faster in low light, but it's still remarkable to behold a live view camera focusing so quickly. Even in low light situations, where I'd find the Canon T3i seeking for several seconds in Live View to settle on a focus position, the G3 finds focus quickly; a little slower than in normal room light, but considerably faster than any SLR in contrast-detect live view. And when the light gets really low, the Panasonic G3 has another advantage over the T3i: a bright orange AF-assist lamp. You have to be careful not to block it while holding this very small body, but it makes the G3 acquire focus faster, and you don't have to pop up the flash (the T3i pulses its flash for AF assist). Lenses. It used to be that all Panasonic Micro Four Thirds lenses were superb, but we've found the kit lens we received a little less than stellar, with the upper right corner in particular being softer than it should be. It's not a deal breaker, by any means, but we recommend checking your copy both focused near and focused far (ours is worse when focusing far than when focusing near) before your option to return or exchange the lens expires. One thing in its favor is that it's light, and it focuses pretty fast, as we've already covered. We have the 14-140mm lens (28-280mm equivalent) as well, which does pretty well at middle focal lengths, and we enjoyed shooting with it again. But we also had some more modern Olympus lenses, including the slim and light 14-150mm M.Zuiko lens (28-300mm equivalent), just a little longer than the Panasonic lens. We liked the image quality, and the lens focused quickly and silently, and even worked with videos quite well, as it's designed to do. The Panasonic G3 also looks and feels less overburdened by the size and weight of the 14-150mm M.Zuiko than by the 14-140mm Lumix lens. 9-18mm. The G3 works quite well with the 9-18mm M.Zuiko lens, focusing fast and shooting wide. I also had a little fun with the 9-18mm M.Zuiko (18-36mm equivalent), which is also fast and quiet. Olympus's optical and build quality has reached the point where lenses can be swapped freely between platforms, which is good for everyone. The only disadvantage to using Olympus lenses on the Panasonic G3 is the lack of built-in image stabilization, because Olympus uses sensor-shift stabilization in their bodies, while the G3's IS is built into the lenses. Interface. Though there are a few good reasons for the Panasonic G3's touchscreen, I prefer navigating with the buttons more than the screen. I also find the touchscreen too often gets in the way. Little educational screens delay my entry into Playback mode, for example, telling me to "Touch screen to enlarge image," yet again. Thank you. Setting AF points, which is as easy as touching the screen, is a very good use of touchscreen technology, of course, but I still find myself frustrated with it. Scrolling around in the Pinpoint AF mode is more difficult than it should be, and the onscreen buttons are too often in the way of the view, so that I can't see if I'm getting all that I want in the frame. Getting them out of the way is impossible, unless of course you disable certain parts of the touchscreen interface. You can enable or disable the Q.Menu, the Defocus Control, Touch Shutter, Touch Display button, and Touch Autofocus. Leaving Defocus Control and Touch AF on eliminated nearly all of my irritation with the touch interface. There's no EV Compensation button on the Panasonic G3, but I remembered to press the Rear dial down and there it was: the dial's function changed from controlling Program shift to the EV adjustment. While making either adjustment, a handy sliding scale comes up showing available shutter speed and aperture settings. EVF. Switching from the LCD to the EVF is now only possible by pressing the EVF/LCD button left of the viewfinder; the infrared proximity sensor was removed to save space. I'm not one who requires an EVF on a small camera like this, but I did use it now and then. I found it was quite good, and it's hard to get used to the lack of the usual "grid" one sees when looking at most LCDs: This display is just a smooth image, edge to edge. While I did find the EVF handy in bright light, sometimes that ambient light was so bright that I found the EVF image seemed washed out, or else insufficiently bright to overcome the light already meeting my eyes from my surroundings. The articulating LCD is excellent, my favorite kind for just about all purposes. It worked well enough for me in bright sunlight and was handy for shooting from a wide variety of unique angles. Menus. While from the outside it seems like a fairly simple camera, the Panasonic G3 has a lot of options, and as such it also has a lot of menus. Moving through menus is a tedious process, requiring that you scroll through multiple screens, reading sometimes odd descriptions. It's often hard to remember under which tab a given menu item is located. It's a common problem with side-tab menu designs, one that also plagues Nikon and Olympus cameras. The Panasonic G3's menus aren't quite as deep as that, but it's a little too much all the same. Small buttons. I didn't have much trouble with them, but I should note just how small the buttons are, as I know it'll drive some folks crazy. Also, if you're using the Panasonic G3 with gloves, you're going to have a tough time unless you take them off. Such is the burden of a small camera. One small button in particular did drive me crazy: the iA or Intelligent Auto button. Though I say it's very well designed and comfortable to use, the Panasonic G3 is very small, with very little unused surface area, so I kept pressing the iA button while shifting the G3 from hand to hand or even just bringing it up to get a shot. I'm seldom sure exactly when it happened, but I could tell when the camera started showing little icons in the upper left corner (and a little too much color overall), that I'd accidentally pressed the little button, which glows blue when active. In the Custom menu, you can change its mode of activation from Single Press to Press and Hold, which reduced my tendency to activate the Intelligent Auto mode. Battery life. It's a little disappointing that the G3's battery is smaller. It results in fewer captured shots and fewer videos per charge. I typically shoot for about an hour at a time when photographing the kids at play, and in that time, the battery drops from three bars to two. That's way too quick. For any day long outing, you're going to need a second battery, no question. Dynamic range. The lab found somewhat limited dynamic range, despite some excellent image quality, and I saw the same thing in a few of my shots. Skies very frequently overwhelmed the foreground, leaving it darker than I'm used to for most cameras, and mids seemed darker in bright sunlight, likely to save the highlights. We'll have to look into this a little more before we finish the review. Artifacts at low ISO. We ran into some of the same artifacts we've seen in other Lumix G-series cameras, which we attributed to demosaicing errors. The artifacts are blue/gray, and appear in our indoor incandescent lighting test images at ISO 160 and 200. The artifacts disappear at ISO 400 and above, and only appear in JPEGs; images processed from RAW do not show the artifacts. So far we've only seen the artifacts in our INB shot, which includes a mannequin with reddish hair, captured under incandescent light. Roll over the RAW and JPEG links at right to compare the images. Video. As noted, the Panasonic G3 also shoots 1080i video, but only in AVCHD mode, which looks pretty good in good light. We've shot some low light video as well, which we'll be looking at soon in more detail when we post our Video page. A full set of sample videos will be posted soon, but in the meantime, click on the image and link at left for a couple of video samples. Shooting with the Panasonic G3 was an excellent experience, and while I would hesitate to recommend a larger GH or G series Panasonic to most who asked me without asking a few more questions, I will not hesitate to recommend the Panasonic G3. It's not just a lot of fun, it's capable and reliable, and satisfies the need for SLR power and quality in a very small package, finally setting itself apart from the pack. Most digital SLRs will produce a reasonable ISO 100 shot, so we like to push them and see what they can do at ISO 1,600, at their default noise reduction settings. Recent advances in sensor technology have made ISO 1,600 look a lot more like ISO 100, but there are still cameras whose quality starts to fall apart at this setting. We also choose 1,600 because we like to be able to shoot at or above this level when indoors and at night. We also explore ISO 3,200, and look at the high-contrast detail of ISO 100 vs 3,200 and 6,400. Be sure to look at our Optics and Exposure pages, and our Thumbnail and Gallery pages too, to see the breadth of test shots and analysis available for your perusal; you can even download images--both JPEG and RAW--and examine them for yourself! The Panasonic G3 comes out swinging against the Canon T3i, a camera with an 18-megapixel, APS-C sensor, and really does a great job without as much sharpening around high contrast areas, and considerably better noise control in the shadows. Detail in the mosaic graphic isn't as distinct, but the G3 is looking a lot better than the GH2 or G2. Neither does well at the red leaf swatch, with the G3 darkening the cloth, and the T3i brightening the red and creating an imaginary impressionist view of the leaves. It's a pretty close match between the G3 and the Nikon D5100, with both turning out a fairly realistic looking image. The exception is the red leaf swatch, where Nikons almost always do better. This time, though, I give the shadow behind the olive oil bottle to Panasonic, it's smooth with only hints of luminance noise if you really squint at it, while the Nikon has both luminance noise and chroma blotches. Here's an indication of why we're so excited about the G3's image quality. The crops speak volumes. The G3 is smooth, with more accurate color, while the G2 is noisy and green, with relatively dirty shadows. Again, up against the GH2, it's clear that Panasonic finally heard our cries about the greenish cast their JPEGs produced. Going up against the 14-megapixel A560, the G3's 16-megapixel sensor does very well, with comparable detail, and less noticeable noise suppression than the Sony's treatment. The G3 has some advantage, though, due to the different framing of 4:3 vs 3:2, which makes the elements appear larger in the G3's images. At ISO 3,200 a lot changes for the Panasonic G3: it's images are darker, and noise suppression and sharpening start to get a bit more creative, just as we'll see in the Sony A560 image. Still, it does well against the T3i, with a little more apparent detail and still decent color. We won't even talk about the red leaf swatch at this point, but notice where the pink below has turned into more of a dark purple, where the T3i still renders a more correct pink. Nikon's more pointillist approach probably wins at the printer, again showing that Nikon evenness across the range of image elements. 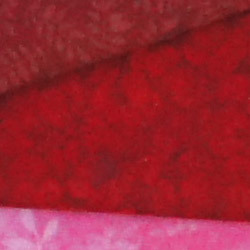 But the G3 does pretty well--until you get to the red leaf swatch, and you can see what I'm talking about with evenness. Wow! Now you can see even more clearly why we're impressed. No other comments needed, as the G2's images tell their own sad, darkening tale. 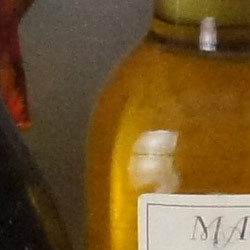 And the G3 also bests its better, more costly brother in the high-ISO still contest, with more detail in both of the bottles, though the red leaf swatch does have a hint more detail. The Panasonic G3 does better than the A560, except in the red leaf swatch, where the A560 finds a little more detail than the G3. 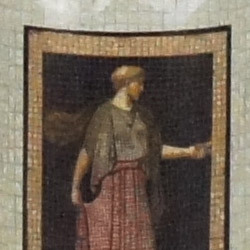 Detail comparison. High-contrast details are often sharper as ISO rises, so they're worth a look as well. Note the nice, distinct lines inside the big letters at ISO 160, 3,200, and even 6,400. Even the T3i doesn't get this done. Even the GH2, which has the same 4:3 ratio advantage. The G3 is clearly a step in the right direction for Panasonic. All of the Panasonics were shot with the very sharp Olympus 50mm f/2.5 Four Thirds Macro lens, but the others were shot with the very sharp Sigma 70mm f/2.8, so each has a fair shake. The Panasonic G3 does incredibly well, raising the bar for Micro Four Thirds cameras, and overcoming the limitations of the smaller sensor size. This is exactly what we've been hoping for generation after generation from Panasonic's Lumix G-series, and they've finally done it. Print Quality results below tell the rest of the story. ISO 160 shots look great at 20 x 30 inches, with good color and excellent detail. 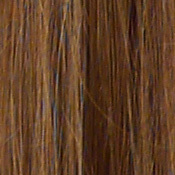 One issue does emerge at this ISO, though, captured in our INB indoor incandescent shot, where our model's red hair shows some demosaicing errors, which appear as blue/gray artifacts, and don't become negligible until the image is printed at 11 x 14 inches. Processing RAW images on a computer does not exhibit the error, by the way. ISO 200 shots are also great at 20 x 30, with excellent color and detail. The demosaicing error is still present, but less noticeable. ISO 400 shots, too, look surprisingly good at 20 x 30 inches. There's the slightest softening, but you have to get close and squint to see it. The demosaicing error is eliminated by the noise suppression system. ISO 800 shots finally start to show a little more softening, but we'd still call it usable at 20 x 30 inches. There is some very slight luminance noise in the shadows, but very little. All of this returns to impressive crispness when printed at 16 x 20 inches. ISO 1,600 images are usable at 16 x 20, though low-contrast detail in reds has begun to disappear more noticeably, and there's more noise in darker areas. Prints at 13 x 19 look great. ISO 3,200 images usable for wall display at 13 x 19, and fine for close viewing at 11 x 14. Luminance noise in the shadows continues to increase, but it's not bad at all. Color also dims more noticeably at this setting, with a slight green cast coming into yellows, but not nearly as bad as it has on past Panasonic cameras, including the GH2. ISO 6,400 shots are usable at 8 x 10 and good at 5 x 7. That green shift in the yellows continues, but is still better controlled than any previous high-end Panasonic camera. Overall, the Panasonic G3's JPEG images print amazingly well, and challenging any concern that Micro Four Thirds sensors would continue to lag in image quality behind their APS-C competition. While upcoming SLRs may do better, it's clear that Panasonic has met the challenge in the meantime. Very impressive! With the compact system camera market heating up, Panasonic's G3 shows that the drive is toward smaller and smaller designs, as was seen in the Sony NEX-5. While Panasonic has produced a smaller camera, the G3 marks several firsts, maintaining major big-camera features while reducing the camera's size, increasing its novelty and portability. Improving speed while maintaining the simplicity of contrast-detect autofocus is a major achievement in such an inexpensive camera, one the SLR makers have yet to match. And while shoehorning the excellent EVF and the articulating display into such a small body was a notable engineering achievement, it's the Panasonic G3's dramatic improvement in image quality that truly impresses us. Micro Four Thirds sensors have long been discounted because of their smaller overall sensor area when compared to APS-C cameras, but the quality we see in the Panasonic G3 turns that criticism on its head. It is true that we found a flaw here and there in this prototype camera, but we can't be sure whether they'll appear in the shipping model. We're more blown away by the dramatic improvement in image quality that really vaults the $700 Panasonic G3 to the top of our favorites list. There's more to this review! Don't forget to look at our Optics and Exposure pages, our Performance page, and our Thumbnail and Gallery pages too, to see all the shots we've taken with the camera, uploading them unmodified so you can download images--both JPEG and RAW--and examine them for yourself!